Zucchini recipe the green Italian summer squash, and in Italian the meaning of "zucchino" is small squash. Zucchini, courgettes, summer squash is known by different names with which is called this nice summer vegetable. It is usually cooked and presented as a savory dish or accompaniment with many other great zucchini recipes. 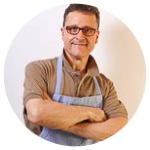 This recipe made with salted anchovies, vinegar, chili hot, lightly fried recipe of northern Italy's Piedmont region. Discard, wash and dry the zucchini, then slice lengthwise with the appropriate tool. Heat plenty of oil in a frying pan and quickly fry the zucchini, a few at a time without overlapping each other. Let drain on paper towels. Rinse the anchovies removing all the salt, and scatter into fillets. Peel the garlic cloves and reduce in slices. Pour into a pan 6 tablespoons extra virgin olive oil, add garlic, anchovies and the cleaned chili. Cook on low heat until the anchovies are dissolved and the garlic is softened. Pour 50 ml of vinegar and simmer several minutes. 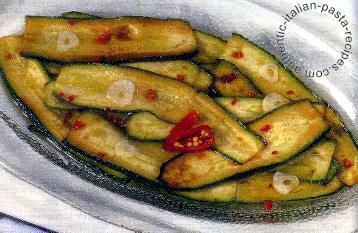 Arrange the zucchini in layers in a suitable dish slightly salted, pour the marinade on and let stand 24 hours.